Hello there! How many of you lovely crafters love Halloween? I do not get into the Halloween crafting as much as some other crafters do but when I saw this adorable jack-o’-lantern pumpkin stamp I knew I had to have it. For the most part, this card was pretty easy to create. 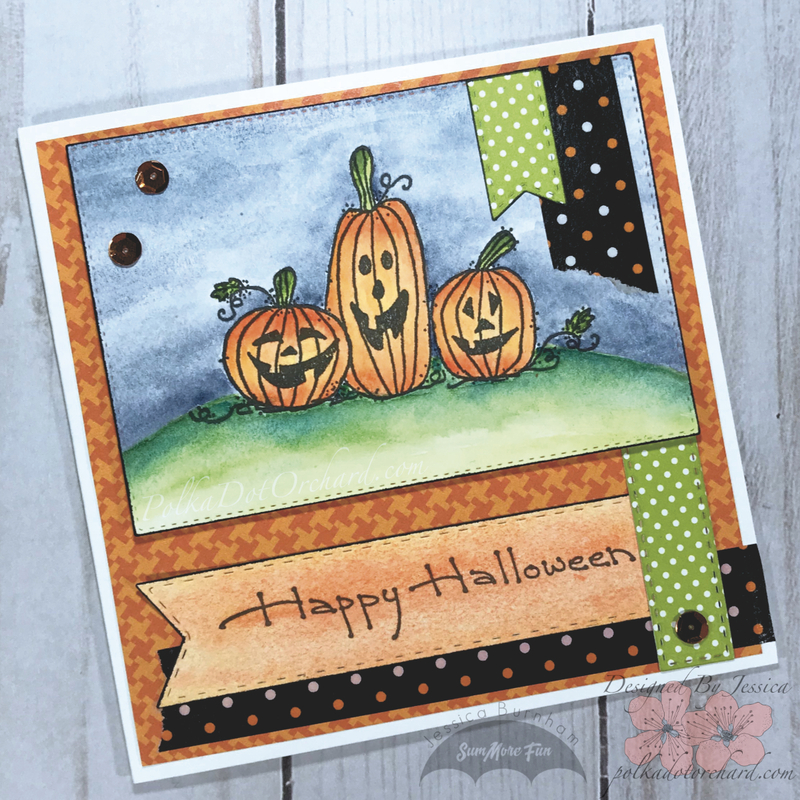 That adorable set of jack-o’-lanterns is a Victorian Original stamp that SumMore Fun carries. Using my MISTI stamping tool and Versafine Black Ink I stamped it on to some Canson 90 lb watercolor paper. I then painted it with Prima Watercolor Confections using some Derwent water brushes. Since this watercolor paper is on the thinner side I did the wet to dry technique. I then used my sizzix big kick to cut my image out with a stitched rectangle die, popped it up on some fun foam and layered it on top of some Doodlebug pattern paper. I then added a sentiment banner that was created with a stitched banner die and the Victorine Originals Dot Happy Halloween stamp and then watercolored to match the painted pumpkin panel. I also used some polka dotted washi tape and some coordinating banners. Finishing it off with some sparkly orange sequins. It’s nice having the insides done too so the cards are ready to go, all I have to do is write a nice hand written message. 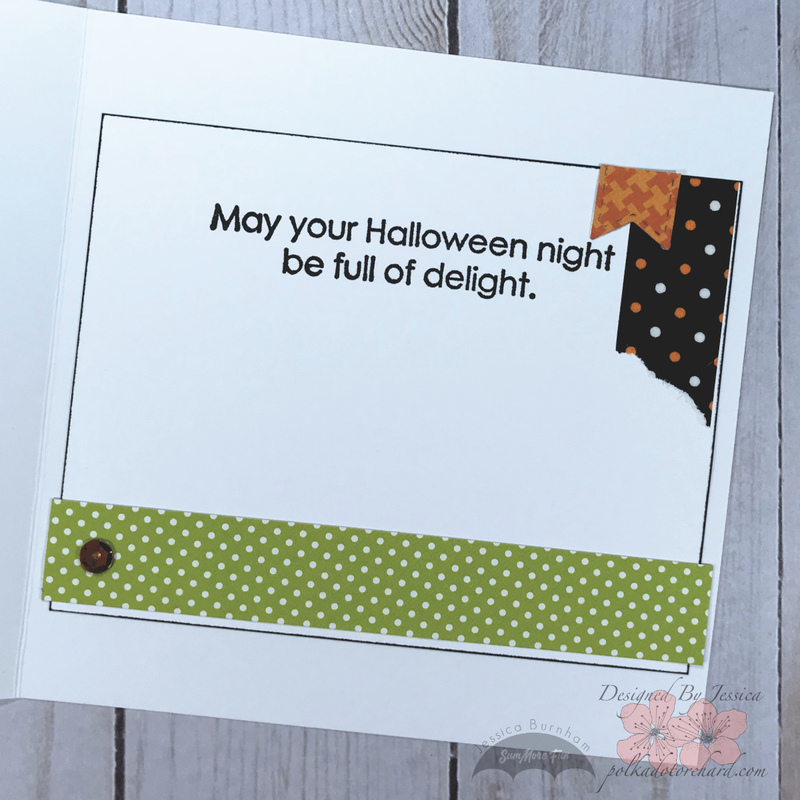 For the inside of the one I stamped the sentiment “May your Halloween night be full of delight”. That sentiment is from the Halloween Kids so stamp set. I used scraps left over from the front of my card to embellish the inside, finishing it off with a single sparkly sequin. Well, that’s it for today. I hope you enjoyed my card and that I have inspired you in some way. Come back soon for more fun card ideas. Super CUTE Halloween Card! Great job with your coloring and I like the papers and inside sentiment! SWEET! !